In a recent visit to Huntington Beach, I paid a visit to Cake Box Pastries, one of the few bakeries in the US that make baumkuchen. It's a pretty unique cake - the name derives from German with roughly translates to "tree cake". 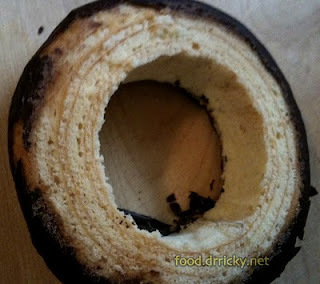 It's a hollow cake, with small individual rings running through it. 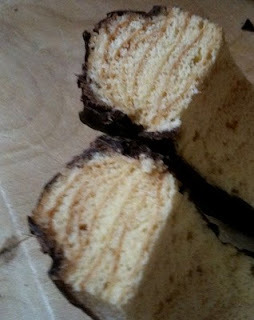 Here you can see the finer layers throughout the cake. 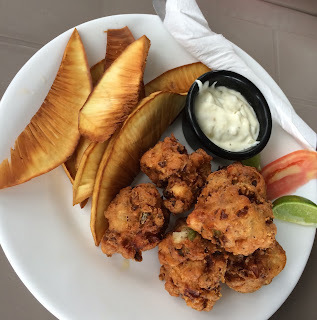 This unique look is a direct consequence of how it's baked: it's cooked on a spit. A rotating spit beside a roaring flame, and batter is basted over the cake as each layer develops a crust. The result is a cake that is more crust than most, firm, and quite delicious. Specially when it's coated in a coating of chocolate. @drricky on Twitter I'm also on Tumblr. Email handle on sciencebasedcuisine.com is drricky - well, you'll know how to deconvolute that if you're not a bot. It finally feels like China to me, whew! What is Tuna Spine Jelly? drricky.net - Dr. Ricky. Awesome Inc. theme. Powered by Blogger.